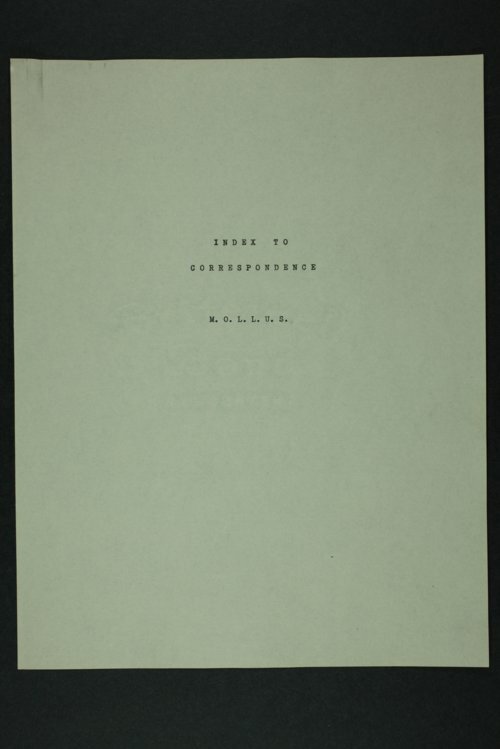 Correspondence of the Kansas Commandery of the Military Order of the Loyal Legion. The correspondence is arranged chronologically and begins with an index compiled in the 1940s. The Military Order of the Loyal Legion of the United States (MOLLUS) was organized in 1865 following the death of Abraham Lincoln and the conclusion of the Civil War as a fraternal organization primarily composed of veterans and hereditary members to memorialize the events of the Civil War. This collection includes frequent correspondence from William M. Abernathy, Edwin Peter Diehl, Samuel T. Cushing, Jefferson Brumback, James H. Gillpatrick, Ulysses S. Grant, Forrest H. Hathaway, W. P. Huxford, Merritt H. Insley, Alexander McCook, John P. Nicholson, Amos H. Plumb, W. R. Smedburg, and Eugene F. Ware, among many others.